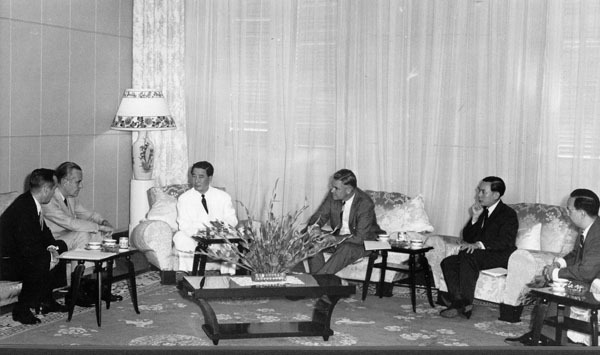 University of Virginia Library Online Exhibits | Photograph of Ngo dinh Diem, W. Averell Harriman, and Fritz Nolting at a conference in South Vietnam. 1961 September 20. 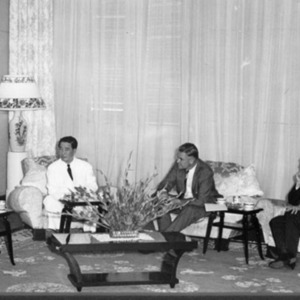 Photograph of Ngo dinh Diem, W. Averell Harriman, and Fritz Nolting at a conference in South Vietnam. 1961 September 20. “Photograph of Ngo dinh Diem, W. Averell Harriman, and Fritz Nolting at a conference in South Vietnam. 1961 September 20. ,” University of Virginia Library Online Exhibits, accessed April 24, 2019, https://explore.lib.virginia.edu/items/show/2282.